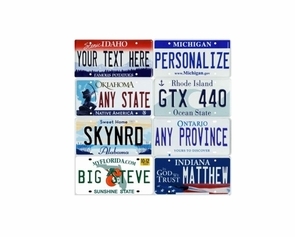 Vanity license plates for ride on cars let you personalize your child's experience with a cool custom feel. Spell out the name of your loved ones today. Perhaps you are a fan of rare names and are frustrated when you visit Disney World only to find that they do not have your name at the gift shop. TrendTimes.com understands and now everyone can have a customized vanity plate for their ride on car. We have every state available in the USA and in Canada too! Please enter the name you would like on the plate in the "Enter License Plate Name" box at the top of this page. It is fun to decide, just like a real car. Plus, it increases the overall realism of your new car as it drives off into the sunset with your little one inside. Had to get new car tags (license plates) for my daughter to match her name and these are perfect.